Printed 4-page program, 5" x 5 1/2", for graduation held at Town Hall. 2 copies. Stetson's Electric Print, Greenfield, Mass. 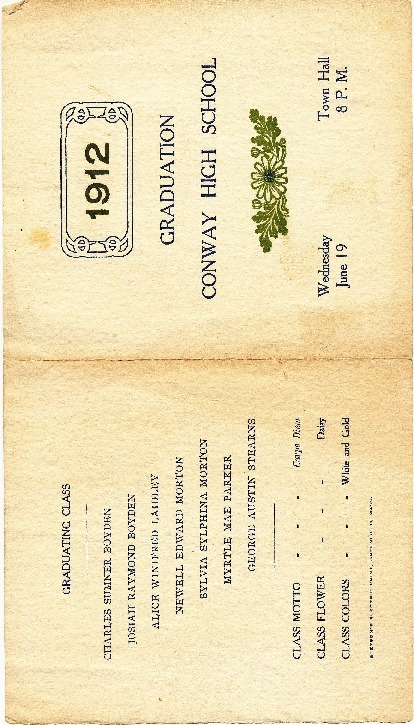 Conway High School, Conway, Mass., “Conway High School Graduation Program, Class of 1912,” Conway Historical Society, accessed April 21, 2019, http://conwaymasshistory.org/items/show/928.